Last year, in 2017, we went to Panama. We loved the wealth of wildlife and the lush forests. We knew that Costa Rica’s ecosystem was very similar, and although we had previously avoided Costa Rica due to its overly-touristy reputation, we decided to go anyway. Costa Rica is indeed very touristy, primarily catering to American and Canadian visitors. They have a dual currency system (US Dollars and Costa Rican Colones), English is commonly spoken, MacDonalds and Walmarts are everywhere. At face value, it doesn’t seem “exotic” – until you reach the areas that you came for: the many national parks. When we were in Panama, we spent time in the cloud forest that straddles the Panama-Costa Rica border. We therefore chose three destinations where we thought we’d see different flora and fauna: the Caribbean coast, the southern Pacific coast/Osa Peninsula, and the Manuel Antonio area, which is also on the Pacific coast. Our first destination was Cahuita, a small village in the southeast coast near the Panamanian border. 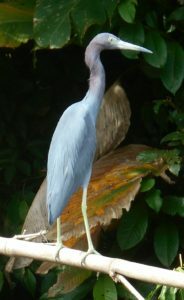 Cahuita is best known for it’s amazing birds, sloths, coral reef, and lots of other wildlife. It’s also slightly off the main tourist route, reached by a coastal road with spectacular views of the beach. We passed through miles and miles of coconut groves, deserted beaches, and crashing waves. Although January is supposed to be Costa Rica’s dry season, climate change has resulted in more rain throughout the country. We ran into this immediately on day 1. We took a short hike in the park, and got completely drenched, despite umbrellas and raingear. Even our waterproof shoes were soaked. But we dried out, and as soon as the rain stopped, we got back on the trail. Cahuita is not what one envisions as “Costa Rica.” The local residents are predominantly of African descent, coming here via Jamaica. There’s a Jamaican laid-back vibe, complete with reggae blasting everywhere. It may be a bit too laid back; we sat down at one restaurant for dinner and left after 20 minutes because they just couldn’t get it together to take our order. But everyone was friendly; there was no hustle. And when we did find a restaurant for dinner, the food was delicious – fish with coconut sauce. We also visited Tree of Life Wildlife Rescue Center and Botanical Gardens which was fascinating, except that Phil was attacked by small red ants. He survived, and learned about the dangers of wearing sandals in the forests (our shoes were still soaked). The Tree of Life is doing genuinely good work to educate and support efforts to protect the local flora and fauna. Our guide was also well versed in the ecosystem and knew the importance of the various plants we say. They had some sloths that they were nursing back to health. We decided to NOT go to the Sloth Sanctuary due to scathing reports about (a.) tiny prison-like cages for the animals and (b.) holding sloths past recuperation in order to attract tourists. Many of these reports came from animal care professionals, including a former staffer. On the way back, we stopped at a roadside stand to buy what seemed to be ubiquitous on the way to Cahuita: Cocada stands. These are instantly-addictive, breathtakingly delicious coconut tarts. We could have eaten only these for our entire vacation and been happy – although our hearts may not have appreciated the butter/coconut saturation. Parque Carara – We went to Carara because it was the opposite of everything we expected in Parque Manuel Antonio, and we were very happy we did. The two parks are similar in wildlife and climate, but where Manuel Antonio is crowded, Parque Carara was quiet. Our lodging was also wonderful; an entire middle-class luxury resort in the forest, with us being the only guests. The birding was fantastic, and the crocodiles gathered under the bridge were gigantic, prehistoric, and oddly weird. Parque Manuel Antonio – We believe that 99% of all tourists go to Manuel Antonio at some point during their visit. They allow in an obscene number of people 3000 at a time – and we’ve read that there are long lines even with that limit. Nevertheless, since this seemed to be required, we added it to our itinerary. Imagine – every time a bird or animal appears, dozens of children start screaming, parents yell at their children, and people run AT the animals trying to get photos. This isn’t exactly the kind of place that most animals will tolerate – except monkeys – who will gladly steal anything from distracted tourists. Nevertheless, we enjoyed the park. What we really enjoyed was the B&B (MyCasa B&B). The owner’s warmth and enthusiasm are amazing, and from the deck of the house we watched a sloth for hours (they move so slowly!) and one evening were entertained by a troupe of squirrel monkeys, an endangered species we felt lucky to see. Corcovado is located on the Osa Peninsula on the southern Pacific Coast. It is a difficult drive or a flight, so a bit hard to get to, which has enabled it to keep its character. The actual village name is Agujitas. A visit here is definitely worth the effort. While our Parque Corcovado experience was good, what’s really wonderful is the area surrounding the village. We stayed at Casita Corcovado, which was like staying with old friends. Jamie and Craig are American expats who rent just a few rooms, and help guests get the very most from their trip. One very nice touch was since most tours start at around daybreak, they serve a full delicious breakfast as early as necessary. We ate regularly at 5am. They set us up on a tour with birding/eco-tour guide Carlos Gonzalez (cell: 506-8720-2986, clgonzalez08@gmail.com), who was the most knowledgeable and eagle-eyed birder we’ve ever met – by far. We later went with him on an equally wonderful mangrove tour. His enormous knowledge and friendly demeanor makes him one of the most popular guides – if not the very best – in Corcovado. We suggest that you book his tours in advance. We spent a lot of time just hanging out at Gringo Curt’s, a restaurant and birding viewing spot in the center of Agujitas. Curt and Charlotte, the owners, are American expats, and have created a birdwatchers’ paradise. See more about Gringo Curt’s below. But mostly, we just walked around the village, south towards Punta Rio (although we never made it all the way there), and north towards the airstrip. It’s a beautiful area with amazing birds. We flew back to San Jose, the capital city, and spent our last day at a few museums, packing, and panicking when Taca emailed us that our flight (the next morning) was going to be delayed and therefore we would miss our connection. We called United, (who issued the tickets), and their impressive customer service rep put us on better flights than we had originally booked. While we were in Costa Rica, and since we’ve returned, we’ve been talking about the concept of what happens when an environmental treasure gets “loved to death.” This phenomenon has been happening worldwide: the Galapagos may be one of the best-known examples. We knew that Costa Rica was another place that was in the process of being overrun with well-meaning tourists, encouraged by a government that needs tourist dollars. Ansel Adams said that the best way to protect nature is to stay out of it. Our mere presence makes an impact, and weak laws and a curious public will continue to negatively impact wild places. On the other hand, Manuel Antonio is a tiny corner of a large ecosystem. Concentrating human impact in a small area may be the best way to allow us to enjoy the natural beauty of Costa Rica while simultaneously protecting the vast majority of it. This isn’t the Galapagos; we’re not disrupting an entire ecosystem. Nevertheless, Manuel Antonio felt like Disneyland, and in retrospect, perhaps we should not have gone there.